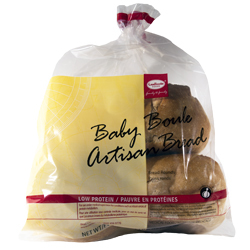 Description: Each package contains 3 low protein bread rounds developed for soup bowls, dip bowls or to make sandwiches. Serving Suggestions: Try making the Sundried Tomato Bruchetta recipe posted on the website under Recipes & Tips. Can be used as a dinner roll, sliced and served with your favorite spread or hollowed out to make a bread bowl and filled with dip or warm bisque. Be sure to dip the pieces of bread taken from the center of the loaf!